Learning objectives: Hirschsprung’s disease (HD) is the most common congenital gut motility disorder and relatively common cause of intestinal obstruction in the newborn. Variants of Hirschsprung’s disease are conditions which clinically resemble HD despite the presence of ganglion cells in the rectal suction biopsies. The diagnosis and management of these patients can be challenging. The lecture will aim to inform the members and delegates the clinical presentation, management and outcome of Hirschsprung’s disease and variants. Professor Prem Puri is the Newman Clinical Research Professor at the UCD School of Medicine and Medical Science, and President of the National Children’s Research Centre at Our Lady’s Children’s Hospital. He is currently the President of the World Federation of Associations of Paediatric Surgeons (WOFAPS) Foundation. He is Past President of the WOFAPS, and Past President of the European Paediatric Surgeons Association (EUPSA). He is Editor-in-Chief of Paediatric Surgery International, and also on the Editorial Board of several other journals. He is Secretary of the International Board of Pediatric Surgical Research. 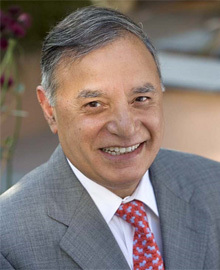 Professor Puri is Honorary Fellow of a number of prestigious medical and scientific societies, including the American Surgical Association (ASA), American Academy of Paediatrics, American Paediatric Surgical Association, Japanese Association of Paediatric Surgeons, and also Argentinean, Austrian, Canadian, Czech, Croatian, Cuban, Indian, South African and Ukrainian. O'Donnell AM, Coyle D, Puri P. Decreased expression of hyperpolarisation-activated cyclic nucleotide-gated channel 3 in Hirschsprung's disease. World J Gastroenterol. 2015 May 14;21(18):5635-40. doi: 10.3748/wjg.v21.i18.5635. Mc Laughlin D, Puri P. Familial hirschsprung's disease: a systematic review. Pediatr Surg Int. 2015 Jul 16. Friedmacher F, Puri P. Rectal suction biopsy for the diagnosis of Hirschsprung's disease: a systematic review of diagnostic accuracy and complications. Pediatr Surg Int. 2015 Jul 9. Coyle D, Puri P. Hirschsprung's disease in children with Mowat-Wilson syndrome. Pediatr Surg Int. 2015 Jul 9.